David Shealy of Ochopee, Florida, shows off a pair of plaster impressions he says he made from tracks of the alleged Everglades Skunk Ape. OCHOPEE, Fla. -- It's big, hairy and smells like a mix of rotten eggs, moldy cheese and dung. It avoids detection by living in muddy, abandoned alligator caves, and it loves to steal pots of lima beans left out to soak. So goes the legend of the Skunk Ape, the Everglades' own Sasquatch. Stories about the burly creature have circulated for decades: It stands more than 7 feet tall, weighs more than 300 pounds and is the color of brown swamp mud. It has a mostly vegetarian diet, but it once killed a deer, split open the belly and ate only the liver. Now, believers point to a tiny brown spot in the middle of a photo as new evidence that the Bigfoot exists. Detractors aren't convinced. The photo, with the spot barely visible at a distance among trees and high grass, was taken by Vince Doerr in July. Doerr, the fire chief in tiny Ochopee about 75 miles west of Miami, said at the time that he saw something large and hairy running on two legs across a gravel road leading into the Everglades. Doerr didn't return telephone calls seeking further comment, but the photo has revved up the Skunk Ape stories. As with any myth, second- and third-hand accounts abound. A man calling himself Scotty in the Swamp tells of an incident involving a friend in the 1950s. Shealy said a group of hunters told him about the night the Skunk Ape fell through the roof of their cabin, its eyes glowing red. As the men scrambled for their guns, it ripped a window from the wall and disappeared into the 'Glades. Bill Carroll said he spent the last eight years as chief ranger of the Big Cypress National Preserve. In all that time, neither he nor any of his 70 park rangers and firefighters -- who annually cover the three-quarters of a million acres by helicopter, airboat, swamp buggy, and foot -- have seen the creature. The Skunk Ape, also called the Swamp Ape, is akin to the legends of the Yeti, Sasquatch or Bigfoot. There are numerous Internet sites dedicated to them, including the Global Bigfoot Encyclopedia that reports ''confirmed'' sightings in five south Florida counties. No Bigfoot has ever been killed or captured, and no carcass or bones have ever been found. The number of sightings in Florida is the greatest number outside of the Pacific Northwest, said Grover Krantz, a Washington State University anthropologist and Bigfoot expert. Five sightings this summer occurred in Collier County, in the 729,000-acre Big Cypress preserve. All of the sightings have been near Ochopee. 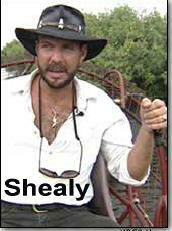 Shealy said he has two, large plaster-of-Paris footprints from the beast. He keeps them in a glass-topped box. Shealy also said he once had a reddish hair sample from the Skunk Ape, plucked from a broken branch seven feet off the ground. He said two men in dark suits with dark wraparound sunglasses, driving a dark-colored car, burst in on him in the middle of the night and took the hair. Last month, Shealy took Doerr's photo to the Collier County Commission. When the commission chairman, Tim Hancock, was handed the photo, the other commissioners huddled around and started to poke fun. ''Mr. Chairman, in the interest of tourist dollars, we should release the picture immediately,'' said Commissioner Tim Constantine. as educational material without benefit of financial gain. This proviso is applicable throughout the entire Bigfoot Encounters Website.